Red Pill vs Blue Pill – What’s Your Flavor? The Matrix is a sci-fi adventure ride in “bullet time” and one of the most significant films in the realm of philosophy and religion. Questions about self, life, what is real? Totally worth the journey! Ever get that nagging feeling that something’s not quite right but, you can’t put your finger on it? Well, welcome to Neo’s nightmare. Thomas A. Anderson (Keanu Reeves) is a man living two lives. By day he is an average computer programmer and by night a hacker known as Neo. The Matrix is a 1999 science fiction action film written and directed by The Wachowskis (credited as The Wachowski Brothers) and starring Keanu Reeves, Laurence Fishburne, Carrie-Anne Moss, Hugo Weaving, and Joe Pantoliano. The film depicts a dystopian future in which reality, as perceived by most humans, is actually a simulated reality called the Matrix, created by sentient machines to subdue the human population, while their bodies’ heat and electrical activity are used as an energy source. Neo has always questioned his reality, (yeh, and for me lately on a daily basis) but the truth is far beyond his imagination. 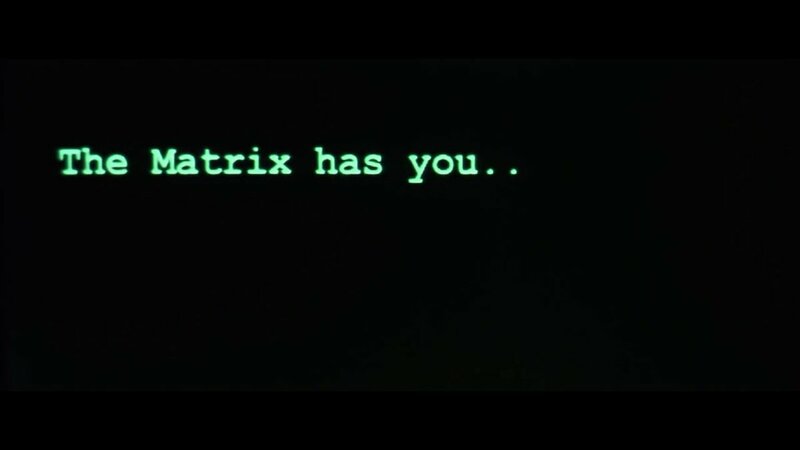 Finding himself targeted by the police, he is contacted by Morpheus (Laurence Fishburne), a legendary computer hacker branded a terrorist by the government. 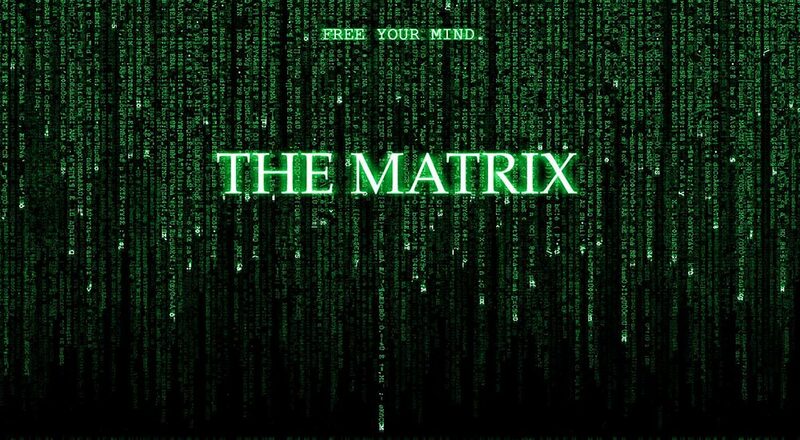 The actors of the film were required to be able to understand and explain The Matrix. The book Simulacra and Simulation was required reading for most of the principal cast and crew. What would you do if offered the choice of a red pill, which will show you the truth about the Matrix, or a blue pill, which will return you to your former life? In truth, I believe we’re presented with this choice every day. Do we attempt to affect the condition of our society, or do we prefer to believe it’s not our problem and you can’t fight the system anyway? Hugo Weaving had to undergo a hip surgery after he sustained an injury during the training process. During the rehearsal of the lobby scene, in which Trinity runs on a wall, Carrie-Anne Moss injured her leg and was ultimately unable to film the shot in one take. The Matrix is known for popularizing a visual effect known as “bullet time“, in which the heightened perception of certain characters is represented by allowing the action within a shot to progress in slow-motion while the camera’s viewpoint appears to move through the scene at normal speed. The film is an example of the cyberpunk subgenre. The Matrix received Academy Awards for film editing, sound effects editing, visual effects, and sound. The filmmakers were competing against other films with established franchises, like Star Wars Episode I: The Phantom Menace, yet they won all four of their nominations. The Matrix also received BAFTA awards for Best Sound and Best Achievement in Special Visual Effects, in addition to nominations in the cinematography, production design and editing categories. In 1999, it won Saturn Awards for Best Science Fiction Film and Best Direction. The Matrix received acclaim from most critics and is widely regarded as one of the greatest science fiction films of all time. This entry was posted in Academy Award, Actors, Actresses, Awards, Directors, Film History, Oscars, Sci-Fi, Writers and tagged #Cyberpunk, #iheartfillmblog, #Keanu Reeves, #Laurence Fishburne, #The Matrix, #The Wachowskis. Bookmark the permalink. This sounds scary. But in reality, there is a prophecy about a pill to get rid of a large percentage of The world’s population. Wow! I hadn’t heard of that before. Yikes! Hope I don’t get one.